Not the most creative titles. With a name like Abraham Lincoln: Vampire Hunter, does it need to be? It's an attention grabber. When I first saw the movie poster, my reaction was- Seriously!? Then came the trailer. I was sold. Wonder how many people are upset their favorite pres. is portrayed as an ax wielding vampire killer? If you decided to see it, suspend your beliefs. This one is solely for entertainment. And I was entertained. I'm a sucker for great action and a good story. This one had both and in 3D. (I'll talk about that later). Outside of the whole Abraham Lincoln being a vampire hunter, they didn't change the image of this famous president. The movie also dealt with slavery, the Civil War, Harriet Tubman and the Underground Railroad. Don't know how accurate it was though. As someone who loves vampire movies, this one was pretty good- anything without sparkling vampires is a winner to me. I wouldn't say it's one of the greats but it didn't spit on every vampire book and movie ever made. Though this topic has been done to death, Abraham Lincoln: Vampire Hunter dealt with these creatures in a way pretty interesting way. It wasn't scary. At least I didn't think so. The vampires were normal looking. They were charming and evil. I still liked them, especially when they fought. The movie used slow motion in the action scenes but it wasn't overused- *cough* Resident Evil: Afterlife *cough*. I grinned every time Abe wielded his ax. The man was vicious. I nearly died when his ax turned into a gun. The fight scenes weren't the least bit subtle. They reminded me of 300 in how bloody and graphic they were. Okay, maybe not that extreme but close. And yes, Abraham Lincoln: Vampire Hunter was in 3D. It wasn't merely an excuse to take people's money. 3D action is awesome! I haven't read the book so I have no idea if it stayed true to the original story. From experience, I'm going to say no. This coming from the person who saw all 8 Harry Potter films. I had to stop comparing them to the books because I'd get annoyed. Two of my favorite books, A Wrinkle in Time and Blood and Chocolate, were made into movies and I refuse to watch them knowing they butchered my favorite childhood stories. The film is never faithful to the book. At this point, we shouldn't walk into a movie expecting to see our favorite book carbon copied onto the big screen. 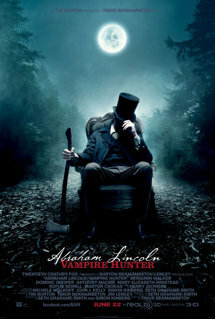 Abraham Lincoln: Vampire Hunter may not be for everyone but I really enjoyed it. Speaking of Resident Evil, another one is coming out in September. It looks pretty epic. Afterlife, the fourth one, wasn't the greatest movie but it didn't have me cursing the writes to oblivion. It intrigued me enough to be excited about Retribution. If the last two are videos, I'll have to look at them from home (we're blocked from youtube at my job). The only vampire movie I really enjoyed was Bram Stoker's Dracula. The awesome special effects were good, but the movie had a really romantic ambiance. I definitely want to see this! I almost bought the book the other day, but I'm not sure if I want to see the movie first or read the book first. I agree that movies don't live up to the book, so maybe I should see the movie first so I'm not disappointed. Terrific review, Auden. I have read the book, and really enjoyed it. I saw the movie myself over the weekend, and had a blast. The movie does differ from the book, and go off in its own directions. Both are a whole lot of fun.